Celebrating an ultrafast future – Ray Eames, Chair of the Lydford Broadband Community Interest Company (CIC), and Sean Cox, a Director of Lydford Broadband CIC, in Lydford-on-Fosse. 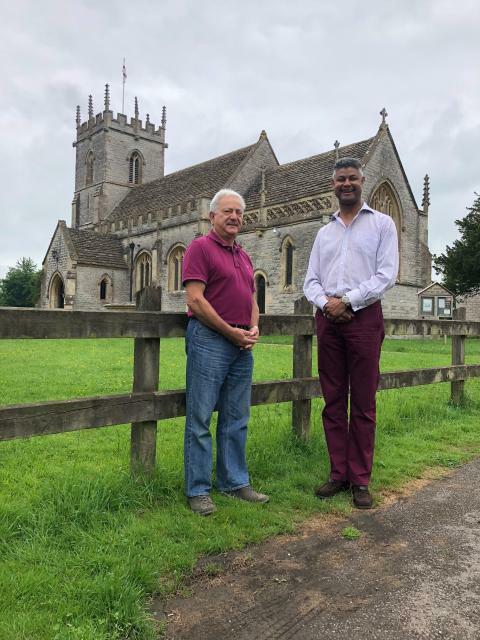 An historic Somerset village is set to get some of the fastest broadband speeds in the UK as a result of a partnership between local residents and Openreach. Openreach, the business responsible for Britain’s largest phone and broadband network, will make the latest ultrafast Fibre-to-the-Premises (FTTP) technology available to more than 200 households and businesses in Lydford-on-Fosse and the nearby hamlet of Foddington within a year. FTTP is capable of delivering speeds up to one gigabit per second (Gbps) – more than 20 times faster than the current average broadband speed in the UK*. The Community Fibre Partnership (CFP) project will involve extensive engineering works, including the installation of about 13 kilometres of fibre optic cabling and the laying of new underground ducting. The co-funding agreement between Lydford-on-Fosse residents and Openreach includes a £30,000 Grant from BT Group. Grants of up to £30,000 are available from BT as part of Openreach’s CFP programme if the technology will also benefit a local school or similar organisation or registered charity. Across the UK, more than 500 communities have already signed up for the CFP programme, which is available to communities not included in any current roll-out plans for superfast broadband or to those who have fibre broadband but want even faster speeds. Lydford-on-Fosse, which straddles the ancient Fosse Way between Exeter and Lincoln, is known to have been established before the Norman Conquest. Ray Eames, chair of the Lydford Broadband Community Interest Company, which was formed by six local volunteers to develop the project, said: ”Ultrafast broadband will be a great boost for our village, parts of which currently can only get slow broadband speeds of less than two megabits per second (Mbps). “We have a mixture of small businesses, people working from home and households who will be able to benefit from this technology. Fast, good quality broadband is now an essential part of modern day life. Kim Mears, managing director of strategic infrastructure development for Openreach, said: “Partnerships like this help us to bring high-speed connections to challenging areas that broadband providers struggle to upgrade alone. “More than 500 communities have joined our Community Fibre Partnerships programme with nearly 300 projects having already been successfully completed. Our ambition is to ‘never say no’ to any community that wants superfast fibre broadband connectivity and we hope that this scheme will encourage even more communities to work with us. *According to the Ofcom Connected Nations 2017 report, the average download speed for fixed broadband in the UK is 44Mbps.